A sales funnel is a marketing system. It’s the “ideal” process you intend your customers to experience as they go from Prospect to Lead to Customer to Repeat Buyer. Sales funnels have been around much longer than web marketing, but the online world is the best thing to ever happen to sales funnels because websites and email marketing make sales funnels easier to build. Think of a sales funnel just like an ordinary funnel. 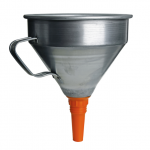 The purpose of a funnel is to make things easier and cleaner. When you put fresh, new oil in your car for example, you don’t want oil spilling all over your engine. So what do you do? You use a funnel to increase the likelihood that ALL (or most) of the oil will go straight to its destination. Sales funnels work the same way — they help you avoid “spilling” (or losing) potential customers. Let’s say I’m in the travel business. I’m a travel agent with my very own website where I offer some basic information about me and my services. A simple contact form or phone number listed on my travel website MIGHT help me get a few new leads here and there. But instead of just waiting for people to pick up the phone and call my travel agency, I offer a free report all about a topic of great interest to my target customers. The report is called “How To Save 50% On Your Next Family Vacation” (or something to that effect). I make the report available to any website visitor in exchange for their first name and email address. Then, every week (or every month) I send out my travel newsletter to everyone on that list. Periodically, I also send out special surveys, limited offer coupons, prizes, other special reports, and much more. Since, in this example, my main business is booking travel, my ultimate goal is to convert newsletter subscribers into travel bookings. But if I develop a more sophisticated sales funnel, I can start to segment my list and target my marketing even more carefully to my “hot leads” and my most active subscribers. This way, I can begin to learn more about my list to offer well targeted new products and services. As my example illustrates, the most critical ingredient in virtually every sales funnel is CONTENT. If you want to attract more prospects to your website in the first place, you need CONTENT. If you want to turn more prospects into leads, you need CONTENT. And if you want to turn more leads into customers, you need CONTENT. Content is so powerful that I much prefer the term “Content Marketing” over the term “Internet Marketing” (as I mention in my report, “7 Massive Mistakes In Content Marketing“). Great marketing has always been (and always will be) about CONTENT. And today, your ability to share great content with your prospects will determine the outcome of your online business operations. I first really understood the idea of “nurturing prospects” after a great seminar and course from the very smart folks over at InfusionSoft. It’s a great way to think about the process of how someone moves through your sales funnel: From (1) Website Visitor to (2) Email Lead to (3) List Subscriber to (4) Customer and (5) Lifetime Customer. 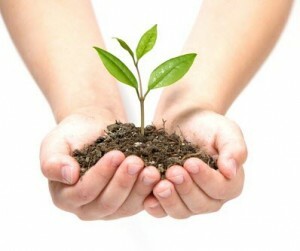 When you NURTURE prospects, you give them what they need to grow strong and healthy. Obviously not every prospect will grow into a “Lifetime Customer” regardless of what you do. That’s just the nature of lists, email marketing, and all the rest. Still, it’s so important to remember that a list of 100,000 weak and “under nurtured” prospects will never stand up against a list of just 100 “strong and healthy” prospects. Nurturing is the opposite of abusing. This is the greatest problem with most “Internet Marketing” approaches to list building and email marketing. Instead of nurturing prospects, online marketers often “milk the list” for all its worth and then go out and build/buy/acquire a new one. That’s abuse, folks – not marketing. Nurturing takes time, thought, and care. So far, we’ve looked at the essential elements for creating the most basic sales funnels. You definitely need to work at putting these key ingredients into place before moving forward — great content, a lead magnet, and email marketing. But the real power of the sales funnel is in growing your Lifetime Customer Value. In the previous section, I listed the 5 steps of nurturing your prospects. The ultimate goal of that process is to create Lifetime Customers. As you can imagine, those lifetime customers will be major contributors to the long-term growth of your business. This is where a lot of businesses fail. It’s a lot easier to sell lots of your best products and/or services to a small group of raving fans than it is to sell just one item to masses of new customers. For example, let’s say your goal is $1,000,000 in annual revenue. If your Lifetime Customer ANNUAL value is $1,000 per year, then you only need to do $1,000 in sales every year to 1,000 customers. If you can keep those 1,000 customers around for 3 to 5 years, then your only job every year is to keep those 1,000 spots filled with nurtured prospects. On the other hand, if you only focus on generating one sale with each of your customers and that sale is only worth $100 in revenue, you’re going to need 10,000 customers to reach your $1M revenue goal. And every year, you’ll have to find 10,000 MORE customers. This failure is why MOST small businesses fail within 5 years or less. A strong sales funnel will make it far easier to increase Lifetime Customer Value and help you reach your annual sales goals. This means nurturing those customers, yes, but it also means working on developing new backend products and services you can sell to ADD MORE VALUE to your lead products. 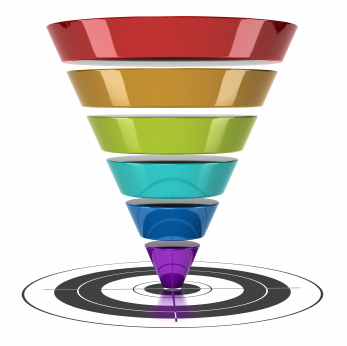 The term “Sales Funnel” refers to this exact process. For every 10,000 prospects you put into the top of the funnel, only 2,000 will become leads. And of those 2,000 leads only 1,000 will buy your lead product. Then, only 200 will buy your backend product and go on to buy more from you over the years to come. These numbers are always different for every business. But you can be sure about one thing — the more time you invest into building and fine-tuning your sales funnel, the more successful you’ll be. 1. How are you attracting new visitors to your website? -Blogging is the single best way to attract new visitors. 2. How are you converting website visitors into leads? -Lead magnets are the best tools for capturing email addresses. 3. How are you building a relationship with your leads? -Providing value and information (without just selling) is critical. 4. How are you learning from your leads & customers? -Surveys and phone calls are a great way to learn more about your list. 5. And how are you turning first-time customers into happy, repeating customers? -Focus on creating backend products that solve your customers’ greatest problems. Get to work on these items right away. Be sure to leave your comments, questions, and other feedback below. can i get a copy of this article emailed to me? would like to print it and show it to owners of my company to explain social media trends with them. very useful and well written info. Of course you can print it out. 🙂 We’d love that. Thanks Jason, very useful information here. I have a question here. If the leads are not by capturing their contact information, but is to let them register for an account on the website. Let’s say membership area. Do you have any suggestion how to build the relationship with them? Or better yet, a post on this would be nice. Thanks! Yes, I would still encourage you to capture information about your members during the sign-up process. Even the most basic information can help you understand your membership base (and your customers, I assume) much better. I very rarely comment on blogs, but felt compelled to here. This post was one of the best and useful posts I have read in a while. I am a procrastinator, and I tend to over-complicate my sales processes so I was looking for something to help me get back to simple ways and the basics and this delivered. Thanks for the comment! Very happy that the post motivated you to bring some clarity & simplicity to your sales process. I’m glad to see such a good resource that does a great job of explaining sales funnels with attention to content. With so much competition out there because of how we all can leverage technology and the internet, providing valuable content to your audience, prospects and customers is key. Thank you for sharing your insight Jason! Thanks for the excellent information! How important would content be to build long-term relationships with Health Care Practitioners, i.e. a Dentist or a Chiropractor?? or how about for a Restaurant? Do you have any good examples of content a small mom and pop restaurant could provide? Hi Gary! It’s very important to build long-term relationships with all your customers or potential clients. Restaurants build relationships with their eaters and their service providers. Instagram works really well for restaurants. You could share the daily special, the waiters, behind the scenes looks. On your blog it is important to highlight what you are doing in the neighborhood, your specials, event packages, studies on eating out, etc. Thanks, Chris! I really appreciate you sharing my post on your site. Glad you liked it. Just found your post in my study of sales funnels. You bring the heart to it. This is really the missing link to online success. Thank you for explaining it so easily. Am not compelled to download the free traffic course because I can imagine the quality of info it would have not to mention returning to the site to have my buffer on other interesting content. Thanks. Hello Jason, how are u? I’m from Brazil and this is the first time that I found your blog. I was looking for “sales funnel” and you gave me a wonderful class here. I don’t know exactly how can I explain, but thank you for this kind of content. It’s really good and teach me a lot. Brazil needs some marketers like you to teach us how to improve our funnels. Thank you very much! Hi Rafael, Thanks for your comment. Sales funnels are definitely a critical part of marketing strategy. Glad you liked the post! Thanks I have been looking for information on sale funnels and this is really good info. Thanks for the valuable information. Can you recommend any softwares/tools to monitor Sales funnel for every Prospect? Very interesting read. Sales funnels are the future!